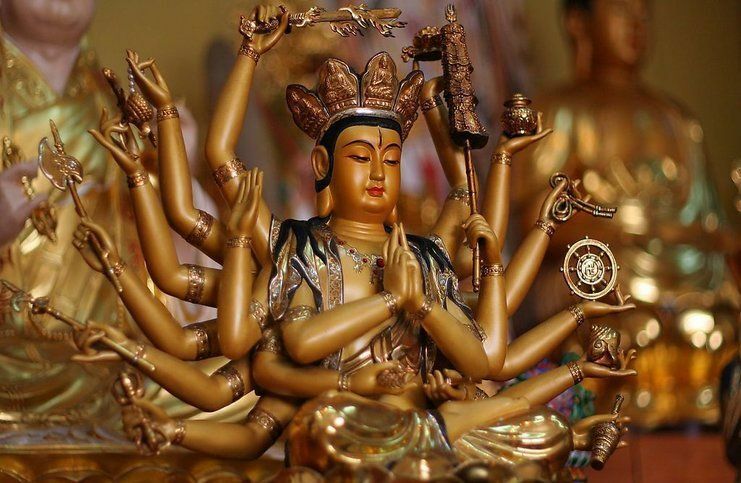 Avalokiteshvara (also known as Chenrezig in Tibet) is a Bodhisattva who embodies the compassion of all Buddhas. Chenrezig is variably described in different Buddhist traditions as either male or female.Also, He is a member of the Lotus family which is headed by Buddha Amitabha. Moreover, He is popularly known as“Holder of the Lotus,” or Padmapani. According to Mahayana doctrine (the largest lineage of Buddhism existing in the present day), Avalokiteshvara is the Bodhisattva who has made a great pledge to assist living beings in times of struggle and to postpone his own Buddhahood until he has helped every sentient being (from creation) in achieving nirvana. Additionally, according to the Karaṇḍavyuha Sutra (a sacred Mahayana sutra), the moon and sun are said to be born from Bodhisattva Avalokiteshvara’s eyes, Lord Shiva from his brow, Lord Narayana from his heart, Lord Brahma from his shoulders, the winds from his mouth, Goddess Sarasvati from his teeth, the earth from his feet and the sky from his stomach. The name ”Avalokiteshvara,” combines the verbal prefix ava, which means „down”, lokita, a past participle of the verb lok „to observe, to notice or behold”, it is used in an active sense. Isvara means “sovereign”, “lord”, “master” or “ruler”. In conformity with ancient Sanskrit rules of sound combination (sandhi), a+isvara turn into esvara. Mixed, the parts mean „lord who gazes down (at the world)”. The Sanskrit word loka (world) is absent from the name, but the phrase is implied. Loka does appear in the Cambodian form of the name, Lokesvara. In Tibetan Buddhism, Goddess Tara came into existence from a single tear shed by Bodhisattva Avalokiteshvara. When the tear drop to the ground it created a lake, and a lotus opening in the lake revealed Goddess Tara. In another version of this story, Goddess Tara emerges from the heart of Bodhisattva Chenrezig. In both version, it is Chenrezig ‘s outpouring of compassion which manifests Goddess Tara as a being. In China, where the Bodhisattva was very popular, he underwent a complete change and became Kwan Yin. He is usually depicted with eleven heads, which represents the eleven directions of space, suggesting that He’s compassionate gaze is infinite in scope. He holds a wish fulfilling jewel or cintamani to his heart, and in his upper right hand a mala (rosary) for counting mantras, and in his upper left hand a lotus in full bloom. HUM unifies spiritual methods with wisdom. Chanting the mantra Om Mani Padme Hum and visualizing that we would like to be like Bodhisattva Chenrezig, pretending that we really are just like Chenrezig, we genuinely can start to realize of the increasing compassion in our heart, and ultimately, awaken as completely enlightened, wise and compassionate Buddhas. This six syllable mantra is very widely recited in Tibet (even in the present day), and not only recited but printed onto flags, carved onto stones, and embossed onto prayer wheels. „Every individual whose heart is moved by compassion and love, who has a sincere heart and deeply acts for the benefit of others with no concern for fame, social position, economical profit or recognition embodies the activity of Chenrezig.” – Bokar Rinpoche’s quote. This entry was posted in Buddhist Mantras on January 16, 2016 by admin.